The power of Brooklyn in this year’s election was highly demonstrated as elected officials, Democratic Party leaders and community activists gathered night after night at various annual Sukkot celebrations across the Borough of Brooklyn. On Sunday, the first day of Chol Hamoed, Democratic candidate for NYC Comptroller, Scott Stringer celebrated his well-earned victory over Eliot Spitzer at a Sukkah celebration hosted by Ezra and Gabriella Friedlander, the CEO of the Friedlander group and a year-long supporter and adviser. “They say nice people finish last; Scott Stringer has proven that not to be the case. Nice people finish first” said the host Ezra Friedlander in introducing the guest of honor. Councilman David Greenfield, who was an early supporter of Mr. Stringer’s candidacy, joined fellow councilman Brad Lander in congratulating Mr. Stringer for a hard fought and well-earned victory. 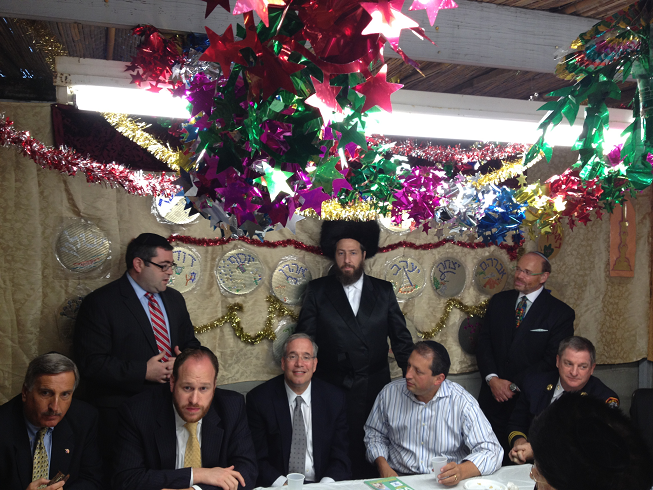 “Sukkoth is a time of celebration. This was a very significant race where the community came together and said clearly we support Scott Stringer, because he was not only the right guy but he was the good guy,” said Councilman Greenfield. Also in attendance were: Assemblyman David Weprin; Daniel Squadron, candidate for Public Advocate; James Leonard Fire Chief of Brooklyn; Abe Eisner, adviser to Gov. Cuomo; Rabbi Yeruchim Silber, JCC of Boro Park; Dr. David Moskovits, Rosh Kehilas Skulen, president Endowment for Democracy in Eastern Europe; Rabbi Steven Burg, Director, Simon Wiesenthal Center on the Eastern Coast; Larry Spiewak, President Chai Lifeline, Chairman, Flatbush COJO; Stuart Appelbaum, President Retail, Wholesale & Department Store Union ( UFCW) and Pinny Ringel, community liaison to Public Advocate Bill de Blasio. On Monday evening, Democratic party elected officials, victorious primary candidates and high ranking NYPD officials gathered together to celebrate the holiday and the stunning victories in Brooklyn, at the Sukkah of one of Crown Heights community’s influential leaders, Mr. Chanina Sperlin. Eric Adams, the Democratic nominee for Brooklyn borough president, told the crowd he’s still concerned about losing the November election–even though he faces only token opposition in the overwhelmingly Democratic borough. “My champagne is on ice,” he said.